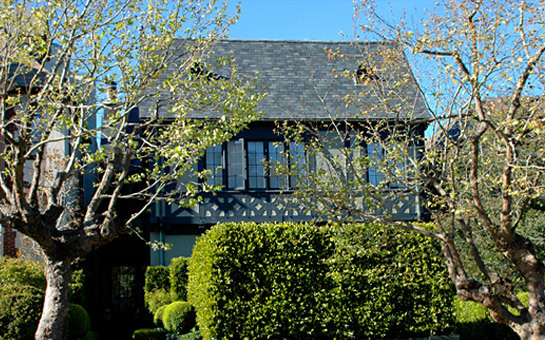 This classic English Tudor is characterized by a high peaked slate roof with a façade of half timbers and cross hatching, symmetrical paned picture windows and leaded glass sidelights. Handsome herringbone brickwork on the elegant landscaped walkway leads to the entryway; a pair of tall hammered columns rise to the balcony/flower box overhead. The setting of the house is reminiscent of a formal English landscape design in both front and rear gardens featuring colorful blooms, lush greenery, sculpted boxwoods and water elements. Secluded seating areas created by tall manicured hedges provide an ideal ambience. The expansive outlook of the Presidio Park grounds beyond further enhances the tranquil green setting. The impeccably beautiful interiors, designed by the Wiseman Group Interior Design in close collaboration with the owners, have been published in architectural periodicals. Polished hardwood floors, deep crown molding, picture windows and multi-paned windows are representative of the interior architectural details. Custom lighting throughout has been designed to focus on art and objects d’art for the owners who are well known collectors. The home is truly ideal for elegant entertaining and relaxed family living. The VESTIBULE with cross barrel vault ceiling and arched leaded glass sidelight leads to the spacious FOYER with tall, wide doorways which open to the public rooms. The warm and inviting LIVING ROOM with alcove overlooks the landscaped south garden. The classic marble fireplace is set against beautiful hand painted specialty finished walls. The window coverings are made of custom fabric matchstick blinds designed to filter the beautiful south sunlight. The intimate wood paneled LIBRARY is finished in a rich walnut faux bois over-paint and features a tall, handsome built-in bookcase which houses the complete entertainment system. The library has paneled double doors and cabinets with custom hardware. Tall double doors open to the formal DINING ROOM overlooking the north garden, flowering trees & Presidio greenery; an expansive mercury glass mirrored wall reflects wonderful light & vistas. The walls are exquisitely upholstered in silk in a fanciful raspberry color and the ceiling has hand applied moon gold (combination of silver and gold gilt). Custom solid bronze hardware complements the window treatment. The sunny, bright & spacious KITCHEN, overlooking Presidio Park’s ever changing vistas, has a walkout limestone terrace for alfresco dining and family socializing; stairs access the large and level Elizabeth Everdale garden, designed to look like a “room within the garden”, with a delightful children’s playhouse, a mini version of the house, in the far end. The POWDER ROOM, located off the foyer, features an custom marble vanity, sink and exquisite hand-painted De Gournay wall covering in an oriental motif. The upper level is accessed via the main staircase with custom runner or via the secondary staircase from the library. The south facing MASTER SUITE with a specialty hand-painted finish looks over the elegantly landscaped English garden. His & her dressing rooms feature custom built-in storage for wardrobes and accessories. The MASTER BATH features marble surrounds with double vanity, spa tub and separate double shower. Two sunny BEDROOMS with grand view windows and bookcases look out to the Presidio. 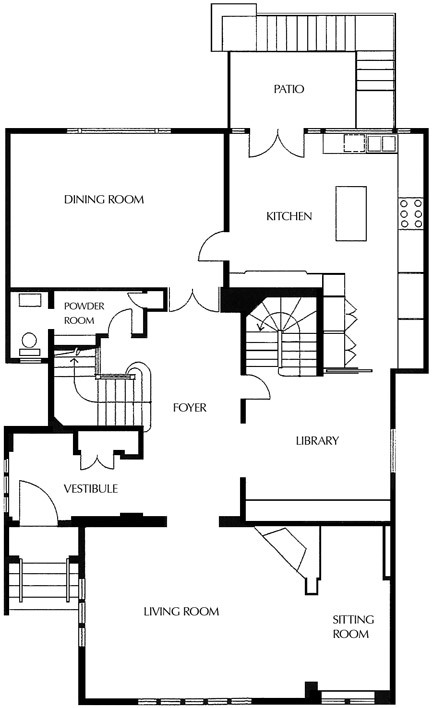 The NW bedroom has a fireplace; the NE bedroom has an adjoining dressing room. A shared FULL BATH with deep tub and pedestal sink completes this level. Natural light infuses the third floor landing through multiple mansard skylights in the soaring ceiling. The FAMILY PENT ROOM features custom built-in “Bali” bed/seating – very comfortable for (flat screen) TV viewing and from which the Presidio Park and Golden Gate Bridge can be enjoyed as well. Cantilevered shelves have built-in lighting for objects d’art. Wonderfully chic ‘his & her’ matching OFFICES also enjoy the northern views & enchanting vistas. Two charming BEDROOMS with gabled ceilings overlook the beautiful homes and tree-lined streets of Presidio Heights. Two new BATHROOMS with stone or pretty mosaic tile surrounds adjoin. The spacious MEDIA/GAME ROOM, open to garden, has a large flat screen television and ample space for children’s play. A HALF BATH adjoins. The owner installed a step-down temperature controlled wine cellar which has a capacity for 2000+ bottles. The side-by-side GARAGE houses two or three vehicles. Gated driveway for privacy & style. House laundry, utilities and ample storage complete the lower level.